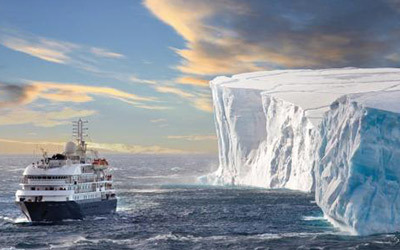 For many travellers, an expedition cruise to Antarctica is a lifelong dream, and considering the time and cost required to undertake such an epic voyage, getting it ‘just right’ is pivotally important. 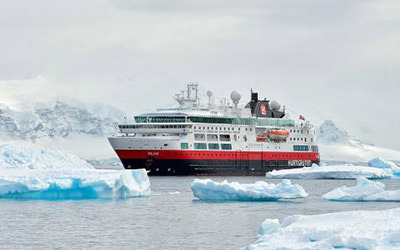 And that means finding the best Antarctica cruise ship, taking into consideration your desires, your budget and even things that you should consider, that you may not even know to consider, like extra activities on offer, time on shore, ship stability and overall cruising comforts. When it comes to Antarctic expedition ships, don’t ever let anyone tell you otherwise: size matters. A lot. Size, believe it or not, is the greatest determining factor when choosing a ship, because size determines price, itinerary, time on shore, comforts, extra amenities, luxuries and everything else that goes along with cruising to one of the most remote destinations on the planet. Now, this does not mean that one size is better for all. Everyone has different needs and desires, so it’s simply a matter of determining which size is best suited to which guest. 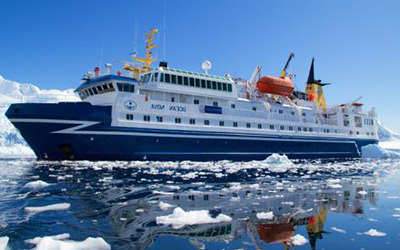 Start looking at options for Antarctica cruises and you’ll soon realise that there is an extensive choice of ships. More than 15 different Antarctic Expedition vessels cruise to Antarctica, all of them offering unique characteristics and prices, which means you’ll find certain vessels will simply fit your travel style better than others. 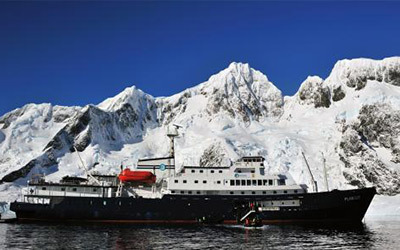 What does an Antarctica expedition ship look like? 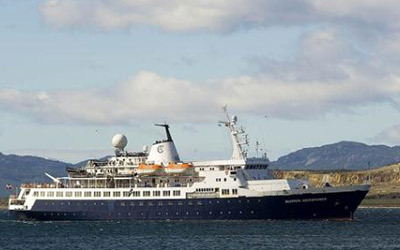 Don’t have much cruising experience and wondering what an expedition ship looks like? Take a look at our walk-through video of the MV Ushuaia, and you’ll get a better understanding of how Antarctica expedition ships are set up. What does the size of the ship mean for your Antarctic Expedition? Back to the size issue. While there is no restriction on size for ships cruising to Antarctica, only vessels with fewer than 500 passengers are allowed to land their passenger ashore. Mega liners with 1,000 passengers, for example, cruise Antarctica without ever letting guests off the ship, and this is a restriction which can greatly limit your experience. The second regulation dictates that only 100 passengers are allowed to be on shore, at any given time. This means that if you’re on a cruise ship carrying more than 100 people, you need to take turns for on-shore explorations, effectively halving your time on land. This and other regulations are important and necessary to protect the pristine beauty of the white continent. 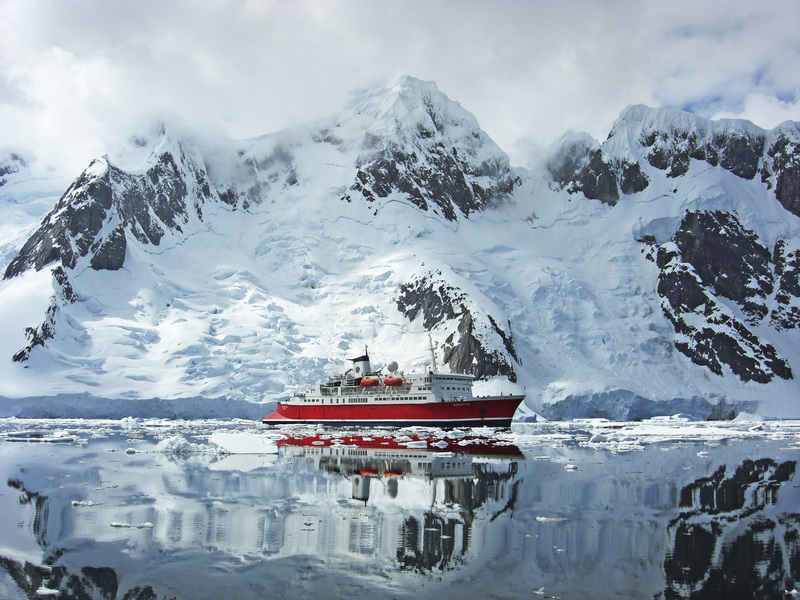 Because we believe that time on shore is THE BEST PART of Antarctica cruises, so the priority – when choosing the right ship and itinerary – should be on ensuring you enjoy the maximum allowable time on land, rather than on the ship. It’s important to note, however, that larger ships do have some quite enticing advantages. They’d have to…otherwise they’d never get a guest on board! Larger ships usually offer more competitive prices and a higher level of comfort and luxury. Usually, they offer a better ‘cruising’ experience overall, and for some this outweighs the negatives. Larger vessels also handle rough seas better, boasting better stability, this being a godsend for those who are anxious about seasickness. People who choose to cruise aboard larger ships trade in less on-land time for more of everything else. 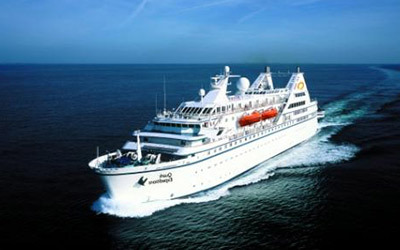 Finding the best Antarctica cruise ship, therefore, will require you to identify your priorities, first and foremost. Here is a quick comparison table of small, medium and large ships, detailing advantages and disadvantages for different vessel sizes. 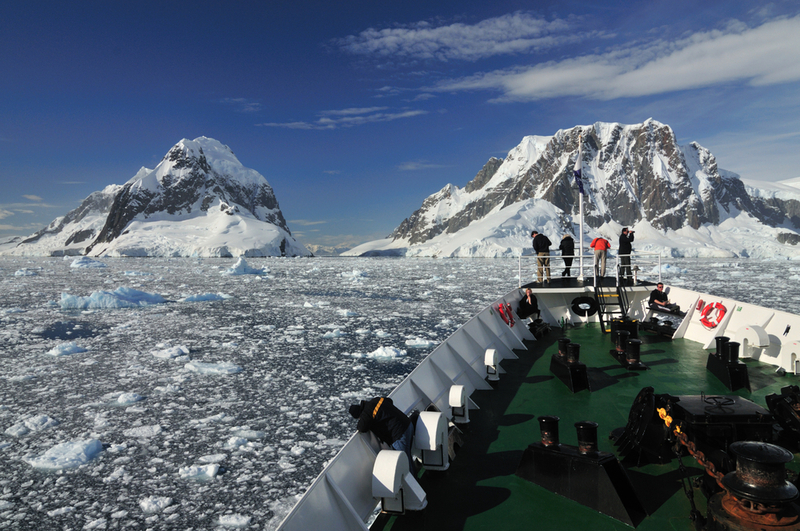 Cruising around Antarctica is unlike any other kind of cruising trip, so it pays to leave all preconceptions aside and concentrate on the important attributes when selecting your preferred ship. Down here, you want a ship that performs well under harsh conditions and offers you a safe and warm haven after days spent exploring what is the most inhospitable, albeit breathtaking, landscape on earth. And without further ado…it’s time to meet your ship! 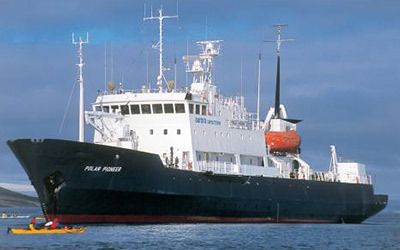 Polar Pioneer, Akademik Shokalskiy, Spirit of Enderby. These three ships were all built at the same time in Russia and although they have all been modified to a certain degree, their characteristics still remain similar. If you’re looking for an intimate, small-group experience, these ships are perfect. They take only around 45-60 passengers, which helps create a high community feeling, something previous guests have praised highly. Built in 1970, the MV Ushuaia is still a handsome looking ship and sits within a ‘size chart’ all on its own. It can host up to 88 passengers, which is bigger than the above-mentioned three ships, yet still smaller than a mid-sized vessel. The MV Ushuaia still retains that small-ship feel, but the slightly higher passenger number means that the fuel costs are spread further, thus prices are a little lower than some of the other small options available. This dame of the seas boasts a very capable and experienced expedition team and this, combined with its competitive prices, make the MV Ushuaia a personal favourite with those who crave an intimate Antarctica experience at a great price, without too many bells and whistles. 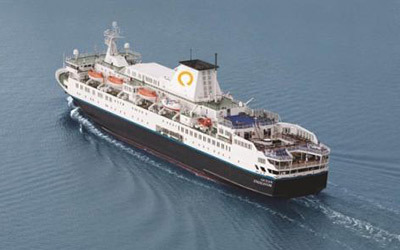 Hosting just 72 guests, the Ocean Nova is another small-sized ship you ought to consider, especially if you’re leaning towards the fly in/fly out cruises to Antarctica, departing from Punta Arenas in Chile. 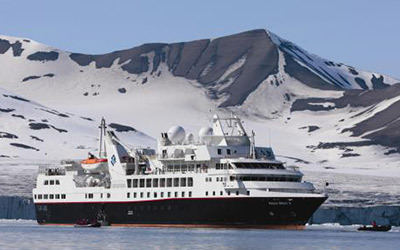 This ship, which has been renovated to a fantastic standard, deals exclusively with cruises from the South Shetland Islands, just off the Antarctic Peninsula. This option is a no-brainer if you wish to cruise Antarctica without crossing the Drake Passage (which can be rough at times) or if you are short on time. 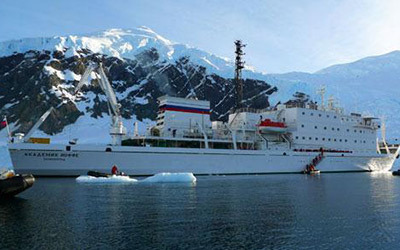 These two mid-sized sister ships were initially built for Russian polar research expeditions and were launched in Finland in the late 1980s. They are very similar in layout and performance, with the only major difference being the bar and upper deck viewing area aboard the Vavilov. 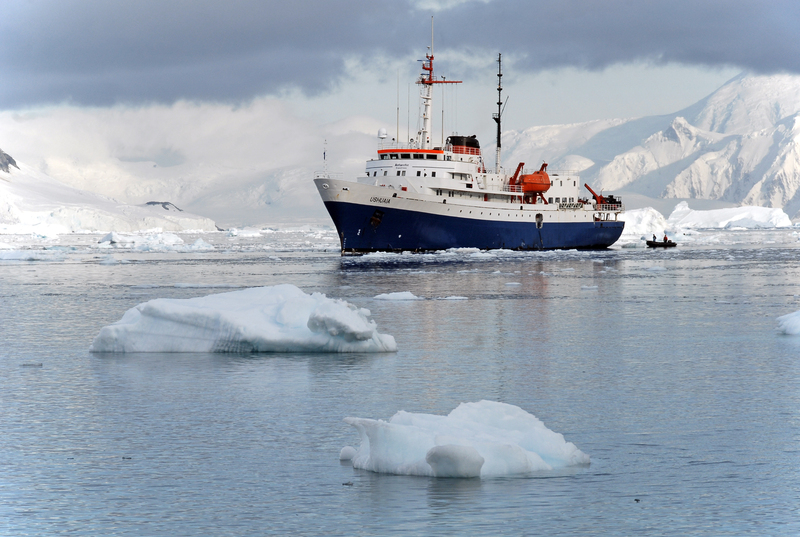 Despite their age, they are still very capable polar ships and many expedition staff still consider them to be some of the best in the market for managing the polar conditions. Despite the fact that they have both been renovated, the Ioffe and Vavilov do feel more like bona fide working ships rather than luxury cruise liners, and although this acts as a drawcard for some, it is a deterrent for others, who perhaps wish for more ‘luxury’ on board their ship. Due to their relative age, these mid-sized ships boast quite a high fuel consumption, which translates to slightly higher prices compared to other ships in their league. 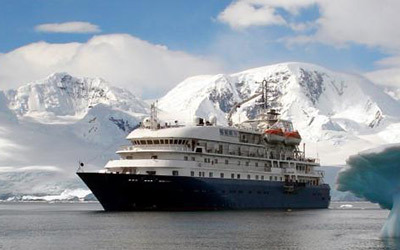 Few mid-sized ships can offer the kind of authentic expedition feel of the Ioffe and Vavilov, however, and this should be the main reason for choosing either one for your Antarctica cruise. 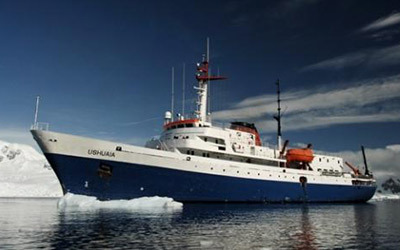 From Norway comes this 1972-built, former Arctic ferry, which was converted to act as an Antarctic expedition cruise ship in 2008. Although the ship is not as technically advanced as the Ioffe and Vavilov, it’s still a very capable ship. The recent installation of new engines has increased its cruising speed, which helps decrease the time it takes to cross the Drake Passage. The new engines also mean better fuel economy, which keeps the prices reasonable for this size ship. The renovation of the ship was substantial and, as such, the interior is quite modern. The MS Expedition still offers an old-world expedition feeling while offering a high level of comfort. Some guests claim this to be a winning combination. Even though these two ships are operated by different companies, we’ve placed them in the same category as they are highly comparable. 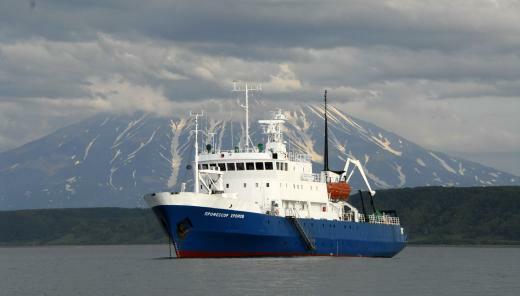 Both host just over 100 passengers, are of a similar standard, and have similar outer deck areas. 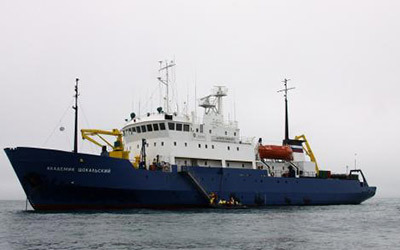 Both have excellent expedition teams on board and are reasonably well furnished, similarly to the MS Expedition outlined above. 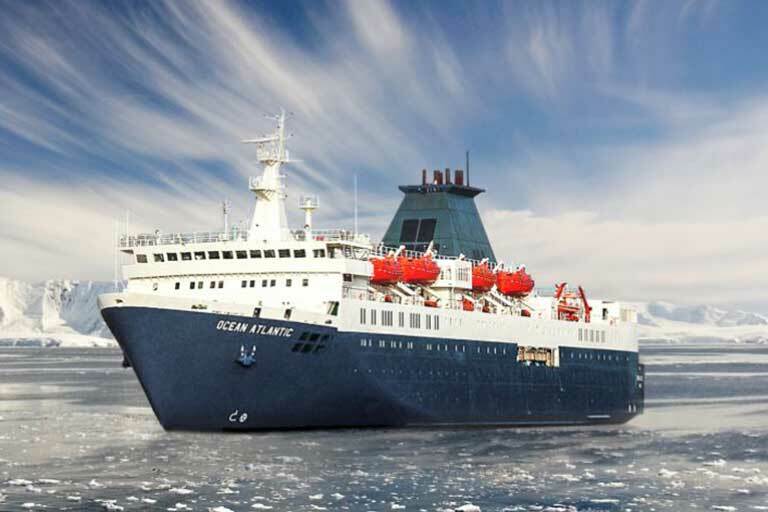 Both the Sea Adventurer and Plancius can handle the ice well, and will get you to Antarctic nooks and crannies which larger ships simply cannot go. Their only downside is that their pricing is often a little higher than some other comparable ships. Here we present some of the better appointed ships, all offering suite cabins, as well as extras such as lecture rooms, bars, gyms and restaurants. Step aboard one of these three and the difference with the other ships mentioned above is evident at first glance. The level of comfort and luxury you’ll enjoy is fantastic, but as with all things in life, you will have to excuse them some shortcomings. None of these ships boasts a particularly high ice rating, which means they can’t barge through frozen seas like some of the tougher expedition ships mentioned above. This means they have to anchor further afield, making on-land excursions more time-consuming. Moreover, while all three ships do boast much fancier interior spaces, they do lack extensive outdoor deck viewing areas, with no deck offering a full, 360-degree view. 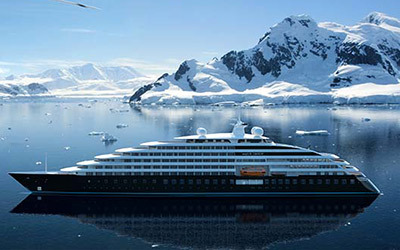 Certainly the most luxurious of ships in this category, the Silver Explorer is probably one of the only mid-range passenger ships to Antarctica which can be called ultra-luxurious. With private butlers, a beauty salon and fine dining, a trip on this ship offers all the glitz…with a price tag to match. The expedition team aboard Silver Explorer is top notch, yet exclusive ships like this tend to attract a very particular clientele, one which (broadly speaking) tends to be a little less adventurous. Cruises on these luxury ships can sometimes be less expeditious, and that’s something you’ll have to keep in mind. Due to be launched in 2019, the MV Hondius will be the strongest ice-strengthened vessel to operate in polar regions. 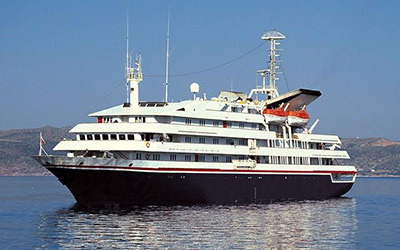 Equipped with stabilizers, the ship will carry up to 176 passengers in 83 deluxe suites and cabins. The Greg Mortimer will be launching in 2019.This new, purpose built expedition vessel which has been designed to withstand the most ferocious winds and waves. 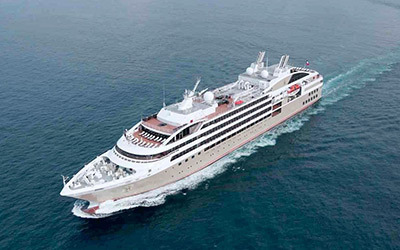 At 104 meters long and carrying only 120 passengers, it represents a new era of expedition cruising. With features such as a 360 degree open deck, a large observation deck and deluxe accommodation, this ship offers exquisite polar expeditions. The World Explorer is a fast and highly comfortable vessel for up to 176 passengers with six tiers of accommodation, all with direct ocean views via a balcony or private walk-out. Communal areas offer the ideal surroundings to relax after a day in the elements; a glass domed Observation Lounge with its full sky views and the social Explorer Lounge for a drink and good conversation. Launching for 2019 Antarctica season. The Ocean Atlantic carries 195 passengers, here is where those landing restrictions really come into play. Although there will be reduced shore time, on the upside an extensive fleet of zodiacs means that everyone gets a chance to go to shore when a landing site is made available. It’s important to remember not all landing sites in Antarctica have heavy restrictions, there are still plenty of sites that allow passengers to enjoy the breathtaking landscapes of Antarctica. 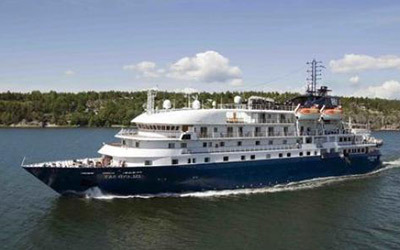 This ship has also recently been refurbished in 2015, with stylish interiors and spacious cabins, it’s fantastic value for experience and is easily one of the most affordable cruises to Antarctica. 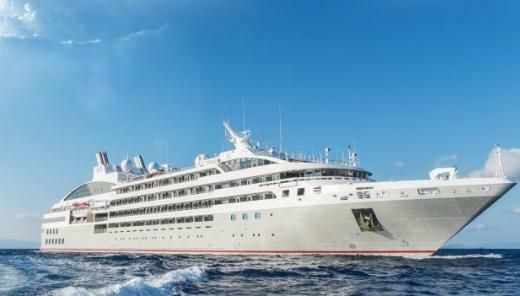 Both the Ocean Diamond and the Ocean Endeavour carry almost 200 guests each, with a full load of guests, your time on shore will be halved, as landings will have to be divided. On the other hand, you will have more time to enjoy the comforts and amenities of the ship. Another major upside, aside from the comforts, is that these larger ships do fare better in rough seas. 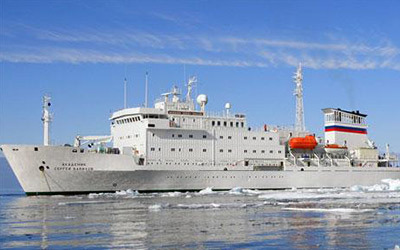 The Fram is one of the larger ships which weave their way around Antarctica, and is one of the most modern vessels, offering every facility imaginable. Interestingly enough, the Fram generally only sails to Antarctica around half full, which means a guest load of only 200. That’s a heck of a lot of space offered to each guest. Due to its size, the Fram obviously has some issues getting into some of the smaller landing sites within Antarctica. The sheer scale of this ship also means that it doesn’t have the family/ community feel of the small and medium ships, although to some this is less of a priority. Like other large ships, landing times on the Fram are also compromised. As an objective recommendation, we’d point you towards the direction of this ship only if its relatively low price is your main incentive. If you’re looking to tick that Antarctica cruise box, and spend as little as possible, then the Fram is certainly suitable. 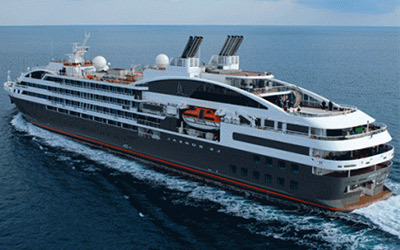 At the beginning of this post we mentioned that you should leave all ‘luxury cruising’ ideals behind when selecting your ideal Antarctica cruise ship, yet this argument completely fails when talking about the Eclipse, Le Boreal and Le Lyrial. These liners, holding 260-270 passengers each, are at the top end of the market, and are all well-appointed vessels offering a plethora of luxuries and comforts. A cruise aboard these ‘floating hotels’ is as much about the cruising experience as it is about the actual destination. With private butlers in some cabin categories, fine dining and silver service, these are certainly not backpacker cruise ships! Pricing is, naturally, reflective of all these luxuries. Most of these ships are run by a French company (except for the Eclipse) and therefore most staff on board are French, although all programmes are run in French and English. By their very nature, high-end ships appeal to discerning travellers who expect a high standard of travel and accommodation. 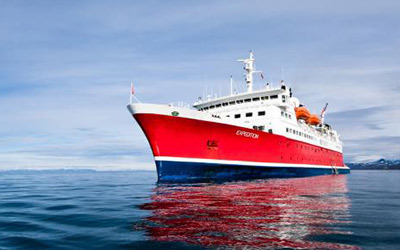 As with the Silver Explorer, people who choose high-end ships when visiting Antarctica do tend to be less expeditious as those who opt for the cheaper, and smaller, cruise ships. At Chimu Adventures, we simply love sharing our Antarctica travel experiences with you. We believe that there is the right cruise, at the right place and the right time for everyone…it’s just a matter of putting it together. If all the information above is still a little too overwhelming, why don’t you reach out to our Antarctica experts? We’d be happy to find the best Antarctica cruise ship option for you and to help you plan your own once-in-a-lifetime Antarctica adventure. Go further south and cross into the Antarctic Circle. Go beyond the normal Antarctica tour areas.